Well hello there, reader. I don’t actually know if you’ve asked this question or not, but you’re reading the response now so I might as well just get right to it. They’re not much to look at, I agree. But what’s important about them is their potential. You see, a lot of people use dryer sheets with their laundry. They make your clothes fluffy, they decrease static, and they make your clothes smell a certain way. However, dryer sheets have a lot of downsides. They’re bad for the environment, have a lot of chemicals, and (though least important) can leave people like me sneezing for hours. You also have to buy more when they run out! But these dryer balls don’t have those problems. They’re made from renewable material (what’s more renewable than wool? ), have no chemicals (unless you count the dye in the wool, but that only depends on the color you choose), and they last for a very, very long time. And if you want your laundry smelling like something besides detergent, a drop or two of essential oils would work! 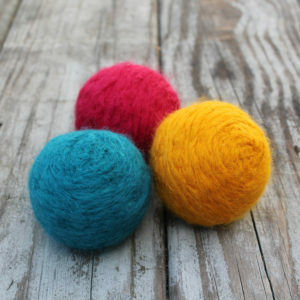 As an added bonus, these dryer balls will help your clothes move around the dryer more than usual, instead of sticking together, allowing them to dry faster. And finally, these are probably one of the best holiday or every-day gifts to give someone. Anyone who does their own laundry could easily use them, so you’d know your gift will be put to good use and not just tucked away and forgotten. Practical, durable, and easy to use, these dryer balls are $6 each, coming in a set of 3 for $18 (as 3 to 4 per laundry load is recommended). So if I’ve convinced you, feel free to check them out!